In 2010 we informed the local health community about this opportunity and over 120 people expressed an interest in learning more about this 16 month extensive leadership training opportunity. 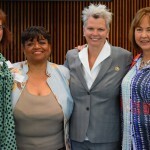 RWJ and the Center for Creative Leadership selected 29 Kansas City fellows through a very competitive process to participate in this leadership training. These 29 young and already successful professionals went through a life changing training experience. In the process they were pushed outside their personal comfort zone. At times they were confused, questioned their ability to lead and struggled to understand their personal leadership style. But throughout it all, they had fun and grew both professionally and as individuals. They learned that leadership is simply not a title…it is a mindset…it is a lifestyle…it is the way in which leaders live their life. They learned to be effective, leaders must be honest, have integrity, communicate effectively and authentically care for others. No matter the job, leaders are in the people business and leadership is about creating a culture of treating people the way you want to be treated.